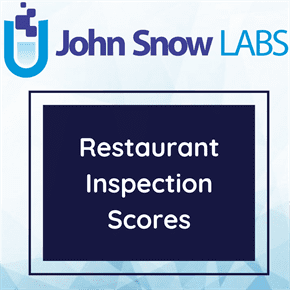 This dataset provides restaurant inspection scores, violations, grades and adjudication information for restaurants in New York City. It also provides the name as well as the location and address of the restaurants. The Department of Health and Mental Hygiene (DOHMH) inspects about 24,000 restaurants a year to monitor compliance with city and state food safety regulations. Since July 2010, the Health Department has required restaurants to post letter grades showing sanitary inspection results. Restaurants with a score between 0 and 13 points earn an A, those with 14 to 27 points receive a B and those with 28 or more a C.
The Health Department conducts unannounced inspections of restaurants at least once a year. Inspectors check for compliance in food handling, food temperature, personal hygiene and vermin control. Each violation of a regulation gets a certain number of points. At the end of the inspection, the inspector totals the points, and this number is the restaurant’s inspection score—the lower the score, the better the Grade. – A public health hazard, such as failing to keep food at the right temperature, triggers a minimum of 7 points. If the violation cannot be corrected before the inspection ends, the Health Department may close the restaurant until it’s fixed. – A critical violation, for example, serving raw food such as a salad without properly washing it first, carries a minimum of 5 points. – A general violation, such as not properly sanitizing cooking utensils, receives at least 2 points. Inspectors assign additional points to reflect the extent of the violation. A violation’s condition level can range from 1 (least extensive) to 5 (most extensive). For example, the presence of one contaminated food item is a condition level 1 violation, generating 7 points. Four or more contaminated food items is a condition level 4 violation, resulting in 10 points. Two types of inspections result in a letter grade: initial inspections for which the restaurant earns an A and re-inspections that result in an A, B or C. A restaurant has two chances to earn an A in every inspection cycle. If it doesn’t earn an A on the first inspection, it’s scored but ungraded. An inspector goes back to the restaurant unannounced, typically within a month, to inspect it again and the re-inspection is graded. If the grade is a B or C, the restaurant will receive a grade card and a grade pending card. It can post either card until it has an opportunity to be heard at the Office of Administrative Trials and Hearings Health Tribunal. Until a restaurant has a graded inspection, it is listed as Not Yet Graded. In this dataset, “Record Date” the date when the extract was run to produce the results for all the records is 2017-06-03.